We Care Adult Care, Inc.
Why Choose Adult Day Care? Open and Celebrating Our Members! © 2019, We Care Adult Care, Inc.
732-741-7363732-741-7363 The #1 Choice For Eldercare – Call Us Today! 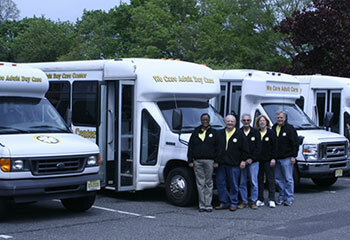 We Care Adult Care, Inc. is proud of its door-to-door transportation facility. Our fleet of safe, well-maintained buses are perfectly paired with our friendly, conscientious bus drivers who make each ride part of the We Care Experience. The fun starts from the moment each member is carefully and cheerfully assisted inside our ultra-comfortable buses, which have plenty of seating, wheelchair access, seat belts and other safety features. Of course, family members can transport their loved ones if they desire, but for those times when you need some time to handle chores, get to work or just relax, trust that our expert and attentive staff will provide you the finest pickup and delivery service around. Nominal transportation fees are listed on our fee schedule page and can be used occasionally or every day, depending on what your schedule dictates. © 2019, We Care Adult Care, Inc. All Rights Reserved.